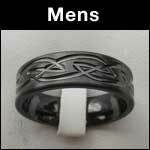 CELTIC RINGS : BRITISH Made : LOVE2HAVE in the UK! The BEST! 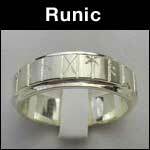 Ogham, Rune and Celtic Knot rings for men and women for sale online in the UK for your wedding and engagement, and all made here in the UK from titanium, zirconium, gold or sterling silver. 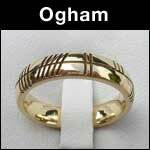 In this section, you will not only find what most people regard to as the traditional styles of UK made gold Celtic rings for men and women, but you will also find other more contemporary styles in both titanium and zirconium. 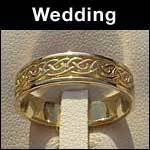 Although traditionally, Celtic wedding rings come fashioned from gold, non-precious metals like titanium and zirconium (as mentioned above) are available too. Silver is always popular, but as it is a softer metal, it isn't the best choice for a wedding ring which will be worn every day for many years to come as it won't wear as well as harder metals. 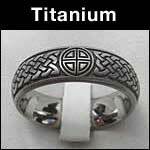 Titanium and zirconium are a good choice as they are both hard-wearing as well as being cheaper than the precious metals. Both of these metals are laser engraved, achieving detailed patterns. 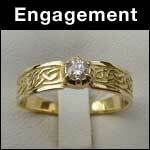 For the more traditional designs, we offer handmade gold cast Celtic rings made from wax carvings. 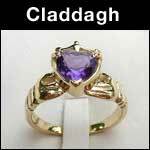 On a final note we are very confident in that not only do we provide the BEST Celtic rings made here in the UK (and probably the world) but also at the LOWEST PRICES too. 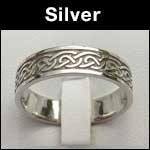 If you think you may have seen the same Celtic ring elsewhere at a lower price, let us know, and we will price match like for like. YES! We can BEAT anyone!